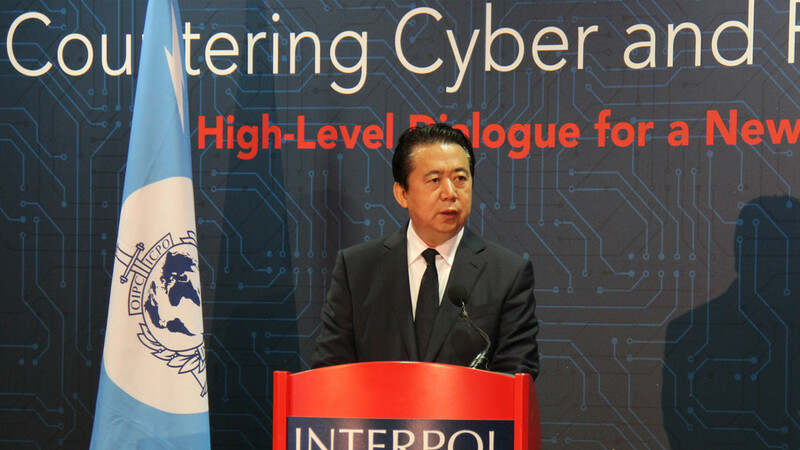 (TibetanReview.net, Oct09, 2018) – Corruption cases involving top-level leaders in China are hardly ever about corruption alone and so it has turned out to be in the case of Mr Meng Hongwei, the missing Lyon-based Interpol chief whom China has confirmed is under detention for investigation. An Oct 8 statement from China’s Public Security Ministry announced the formation of a task force to go after his associates as well while supporting the corruption probe against Meng and pledging “absolute political loyalty” to President Xi Jinping and the party leadership. Meng, who is also one of China’s six deputy ministers for public security, disappeared while on a trip home to China late last month, prompting the French government and Interpol to make their concerns known publicly in the following days on a complaint from his wife. Interpol later announced on Oct 7 that Meng, 64, had resigned as president of the international police agency, effective immediately, hours after China’s National Supervisory Commission, the anti-corruption body, announced that Meng was under investigation. A more detailed official announcement Oct 8 from China’s Public Security Minister indicated that Meng may have somehow been tainted by China’s former security chief and ex-Politburo Standing Committee member Mr Zhou Yongkang who, a Xi rival, is now serving a life sentence for corruption. “We should resolutely oppose corruption and resolutely eliminate the pernicious influence of Zhou Yongkang,” said the statement which was posted on the ministry’s website. It provided no details about the bribes Meng allegedly took or the other crimes he’s accused of, but suggested that he was also being investigated for political lapses. The statement said police would form a task force to go after Meng’s associates, adding that his “insistence on doing things in his own way means he has only himself to blame for being placed under investigation”. It continued that Public Security Minister Zhao Kezhi had convened a midnight Communist Party committee at the ministry, which expressed “unanimous support” for the probe against Meng and pledged “absolute political loyalty” to President Xi Jinping and the party leadership. During a regular press conference on Oct 8, Chinese foreign ministry spokesman Lu Kang has not said directly whether the alleged crimes had been committed during Meng’s Interpol presidency. “The investigation is still under way and further details may be revealed as the probe proceeds,” Lu has said. The action against Meng, whose tenure was due to end in 2020, is seen as extraordinary. “I guess something urgent must have happened. That’s why [the authorities] chose to take such immediate action, at the risk of losing face on the international stage,” the SCMP.com Oct 8 quoted Beijing-based political commentator Zhang Lifan as saying.